Up for a game of badminton? Rewind the clock with our adorable vintage sports pattern. Using vintage colors to highlight hockey sticks, vintage bicycles, roller skates, and even bowling this design will make you want to relive those wonderful childhood days. This design allows you to customize to your taste. 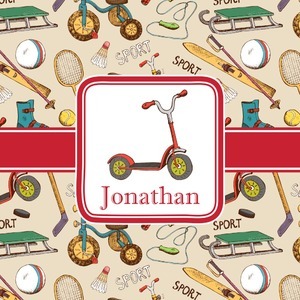 Choose your background color, your ribbon style, label style, and pick a sport to place in the label to highlight. Don't forget to let us know the name you want highlighted in your special design.